In the 40’s of the last century Tsuneichi Okano, who began his career as a blacksmith apprentice in 1925, established the company Okatsune in Hiroshima, Japan. He derived the word Okatsune from his own name. At the beginning Okano forged a limited supply of top quality shears. This was done in a traditional manner, and following a unique process. Over the years, he gradually expanded the product range, always striving for perfection. He made the handles red / white, a combination that stands out, and is in Japan symbolizing happiness. Almost 70 years later Okatsune is in Japan the undisputed number 1, and his shears are being used all over the world with much pleasure. 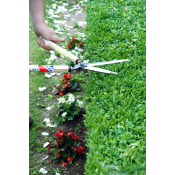 The product range currently consists of pruning shears, cutting and harvesting shears, hedge shears, Bonsai scissors, and Ikebana scissors for traditional Japanese floral arrangements. In Europe, Okatsune is exclusively represented by De Wild B.V. from Roosendaal, the Netherlands. Okatsune’s razor-sharp shears are uniquely forged from the best Izumo Yasugi steel, which is traditionally being used for the Katana swords used by the Samurai. Izumo Yasugi steel is characterized by a high carbon content and is forged by the best master blacksmiths of Japan, using an age-old technology. This process only takes place in the Izumo region, solely using Izumo iron sand. Tsuneichi Okano has managed to industrially produce superior shears that have a very high Rockwell hardness of 60.0 to 61.0 – unrivalled by other brands, through an innovative tempering process. This hardness ensures that the cutting edge remains sharp, slicing easily through wood, and the blades slide smoothly over each other to give an easier cutting action. Soft metal in the core of the blade preserves flexibility, so the cutting blade always aligns with the counter blade, even after intensive usage. This perfection, and unique quality can be recognized by the “singing” of the shears. Razor-sharp: Okatsune shears are razor-sharp. This sharpness is created because the steel of the blades has a very high hardness. This hardness keeps the blades sharp for a long time, and always ensures a clean and precise cut. The blade has been grinded in two angles, so it will also smoothly cut through wood. 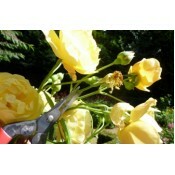 You will notice this by the fact that there is little strength needed for the cutting. Should the blade lose its sharpness, then the steel - despite the high hardness - can easily be grinded with the Okatsune whetstone. Simple: Okatsune shears only consist of a few parts. This ensures a high stability, and optimal ease of use. 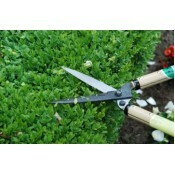 The shears are lightweight and require little maintenance. Robust: Okatsune pruning-and hedge shears are real musclemen. You can effortlessly cut through thick branches without having to worry that the shear gives way, or even breaks. Nevertheless, you will find that the shears are very lightweight. Although Okatsune shears are made from the finest steel, they can rust if not properly maintained. We recommend to clean the blades after use. 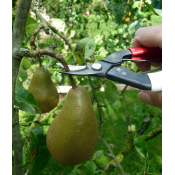 After cleaning, it is wise to oil the shears, and store moisture-free with the cutting blades closed. If you notice that the shear, is cutting less well, you can grind it with the Okatsune whetstone (Okatsune 412). If you treat your Okatsune shear, with love, you will have a lifelong pleasure! 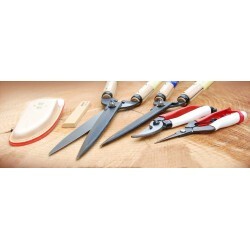 Okatsune 221 are traditional Japanese bonsai scissors suitable for highly accurate forming and maint..
Okatsune 222 are Ikebana scissors with traditional round handles designed according to the Koryu sty..
Large hedge shears with long wooden handles of 50 cm, and a large razor-sharp blade of 200 mm. The l..
Okatsune 301 harvest shears are specially designed for harvesting vegetables and fruit. The curved b.. 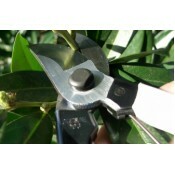 The Okatsune 103 is the most popular pruner in the range. 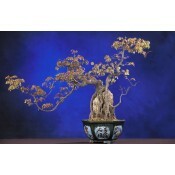 With its length of 200 mm this model is 20.. 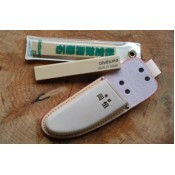 The Okatsune 304 are very light and razor-sharp floral shears with long blade (45 mm) specially desi.. The Okatsune 104 bypass pruners are particularly suitable for the large hand with their length of 21..